We find locks everywhere around us; our homes, offices, facilities, etc. These access control systems provide us with peace and security, but they wear out with time, and need to be repaired or replaced eventually. Some DIYs are great, but they do not even come close to replacing a professional approach to repairing locks and other related areas. Consider a situation where a bolt has been damaged or the whole door has somehow been damaged. You do not want to even attempt this yourself. Only a professional locksmith can help you fix this. If a technical manoeuver is needed, or it is an emergency situation where you are locked out, only a professional can get you out of the mess in no time. Even if you buy your own kit, which on its own is very expensive, you still wouldn’t know how to use it effectively. So what’s the point? Also, you do not want to put your safety in the hands of some handyman or tradesperson. Professional locksmiths provide a wide range of services; commercial, residential, motorized services, all types of vehicle and property locks. This gives you a lot of options. Every profession carries with it, some risk in one form or the other. In an attempt to fix something or force the door, you might bruise or injure yourself and furthermore add more damage to the door. Also the defective doors and ill-fitting locks may aggravate your problems and costing you more money and time in the on run. A professional locksmith will help you avoid all these and repair locks safely without any risk to your property. Only a professional locksmith, would know what is best for your door. Whether you need to rekey your locks, repair locks, replace the entire lock, or just increase the security of your facility, your locksmith will help you in choosing what is best for you. You do not need to pass through the agony of making the wrong decisions. This is particularly useful in seasons where crime rates are increased. You should give your residence or office the best locks to avert burglary attempts. There are professionals in every field for a reason. A professional locksmith is your best bet to identify problems, repair locks quickly and give you a feeling of reassurance. So, whether you are locked out of your home, car, or office, your keys are broken or stuck, you just moved into a new house, have experienced an attempted break-in, want to upgrade your security, etc, you are just a call away from a professional locksmith. Call Racine’s Lock & Key at (262) 509-0366. 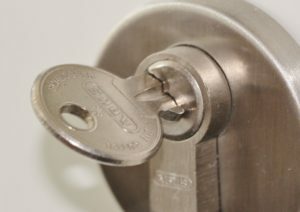 Our insured and licensed locksmith company in Racine can help.